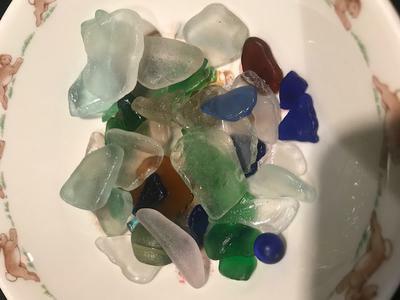 Been collecting sea glass from southern Vancouver Island for over 5 years now. Yesterday's find was a first. Anyone have any idea on the blue glass ball? At first thought it was plastic - then I thought it was a bead....but there is no hole through it. Thank you! my first marble! Thank u very much - I think u r right. I've found similar photos and it is a marble - how exciting! I believe that is a marble! Great find! Beautiful color! Thanks for sharing. I don't know what the ball is but it sure is a good find!